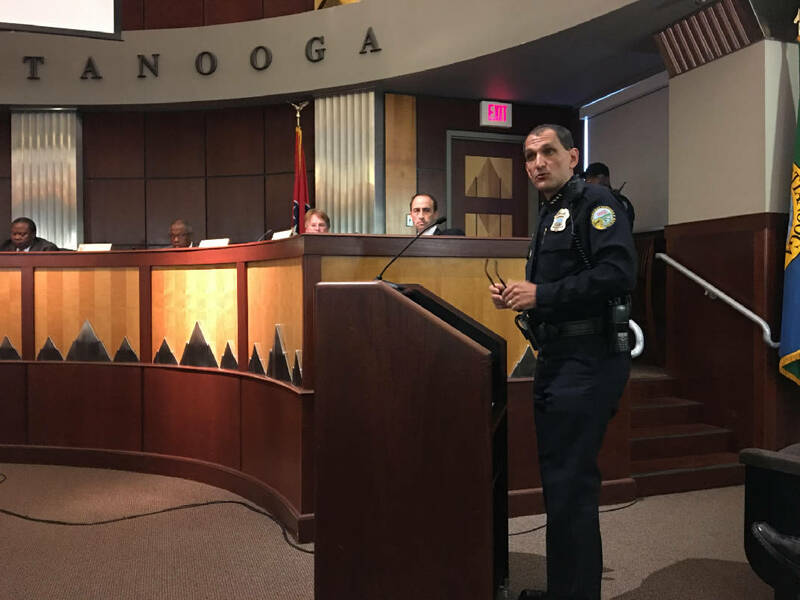 Chattanooga Police Chief Fred Fletcher addresses the City Council concerning the Violence Reduction Initiative during an Oct. 4 presentation. Photo by Paul Leach /Times Free Press. The City Council has approved a new agreement with nonprofit Father to the Fatherless to handle the social services side of the Violence Reduction Initiative, Chattanooga's gang deterrence program. The agency, which started as an initiative of Hope for the Inner City, has provided case management, mentoring and job preparedness services to gang members who seek to leave the life of gangs and violence behind for two years. Father to the Fatherless, now separate from Hope for the Inner City, has offered to provide the services for $230,000 annually — $60,000 less than the Hope for the Inner City price tag. This evening, the council voted 7-1 to approve the agreement. Councilman Larry Grohn cast the opposing vote and Councilman Ken Smith abstained. Grohn questioned determining the agency's success based on offering services. "These are not outcomes," Grohn said. Councilman Russell Gilbert disagreed, equating the agency's work, in partnership with the police department and other social welfare organizations, with building a house. "If we just save one [gang member], it is better than not saving anyone at all," Gilbert said. Last week, Police Chief Fred Fletcher vouched for the program during a city council meeting. "None of us are happy with the results that we have seen with gang violence here in Chattanooga, but we believe we know what the right thing to do is," Fletcher said. "We believe we know the right way to do things." During the previous meeting, several council members asked Fletcher and April Boozer, director of Father to the Fatherless, on how to measure the program's success. "We're still in the process of... working on that, as far as collecting the data and knowing exactly... where to put it at," Boozer said. In other business, the City Council will vote next week to give a property tax break to a proposed $20 million lower-income housing development for the 2100 block of Chestnut Street. Developer John Shepard said the property, currently vacant, will offer an estimated 170 mix of one- and two-bedroom rental units. Rents will range between $600 and $750. The developer plans to finish construction in summer 2018. The tax break proposal lasts until 2032.